St Monica Trust is a not-for-profit organisation delivering well-being for older people through innovative care, support and retirement accommodation in Bristol & North Somerset. Green Hat are a graphic design company based in Bristol. As well as producing really nice work, I love that their whole ethos is focussed on being as environmentally friendly as possible and that sustainability is key for all projects. They have worked with St Monica Trust for many years. Green Hat approached me to work with them on the Vision and Values materials they were producing for St Monica Trust. 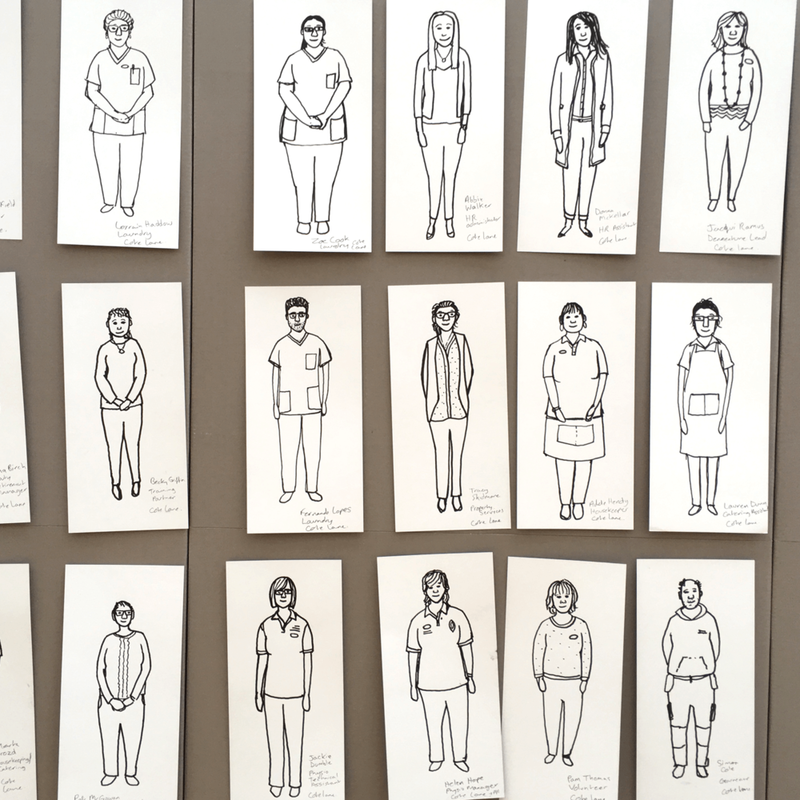 The concept was to draw inspiration (quite literally) from all the people who help to make the Trust what it is, incorporating staff, volunteers and residents across their various sites throughout Bristol & North Somerset. The project involved live drawing sessions at 4 different St Monica Trust locations, with me drawing around 160 'doodle' portraits in total. These were then whittled down to around 100, giving a representative cross section of people in various roles, across the different locations. I worked up the selected drawings into final vector illustrations, creating a pretty extensive and flexible resource for Green Hat to use in the design of the final materials. For my part of the project, the initial stage of the process involved agreeing an illustration style. Having been given a set of photos of different St Monica trust people, I worked up 2 sample style options. Pictured above is the selected style. The initial sample illustrations were used to help publicise the live drawing events and to establish more of a presence whilst we were there, in the form of life-size cardboard cutouts and a recycled cardboard wall which was used as the backdrop for people to stand against whilst being drawn. Pictured above are some of the original portraits from the drawing days. Completed drawings were added to the cardboard wall during each session. The live drawing part of the project was a new challenge for me and certainly took me out of my comfort zone! (Most of my work is digital, working on my own at my desk) However, I did really enjoy the experience, and it was great to meet some of the characters of St Monica Trust... pretty intense with the constant flow of people waiting to be drawn though! Below are some images of the new Values booklet, designed by the team at Green Hat, incorporating my illustrations. 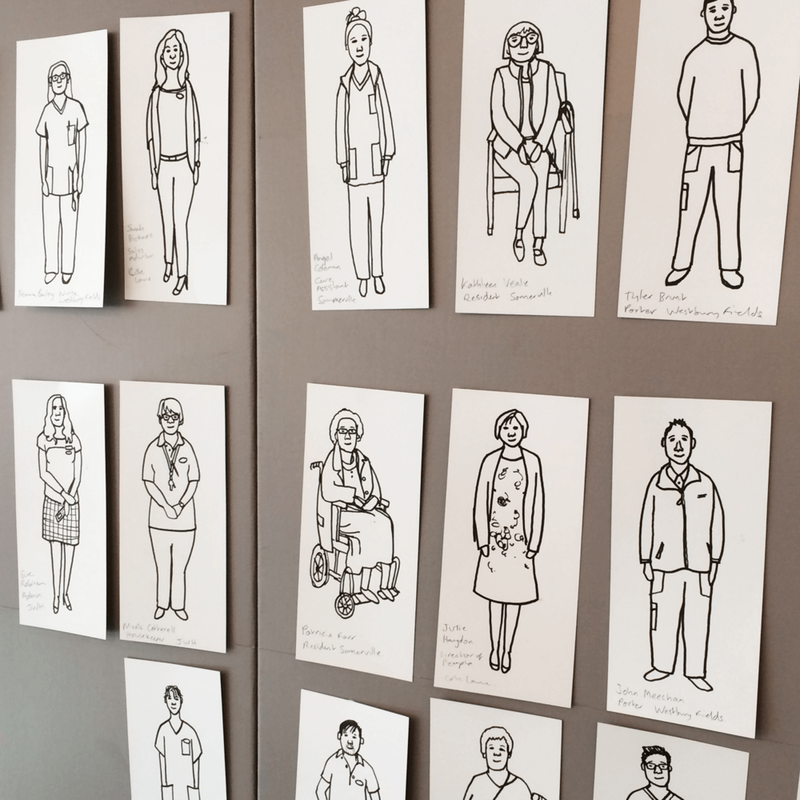 This is basically the first of the completed materials using the people illustrations we've developed – they will continue to be used over time, for print & digital internal communications. Once the Values project had officially launched, I spoke to Naomi Stone, a key member of the team from St Monica Trust who had worked with Green Hat and myself on the project. I was really interested to hear her thoughts about how the Vision & Values have been received, specifically with regard to the illustration aspect…. 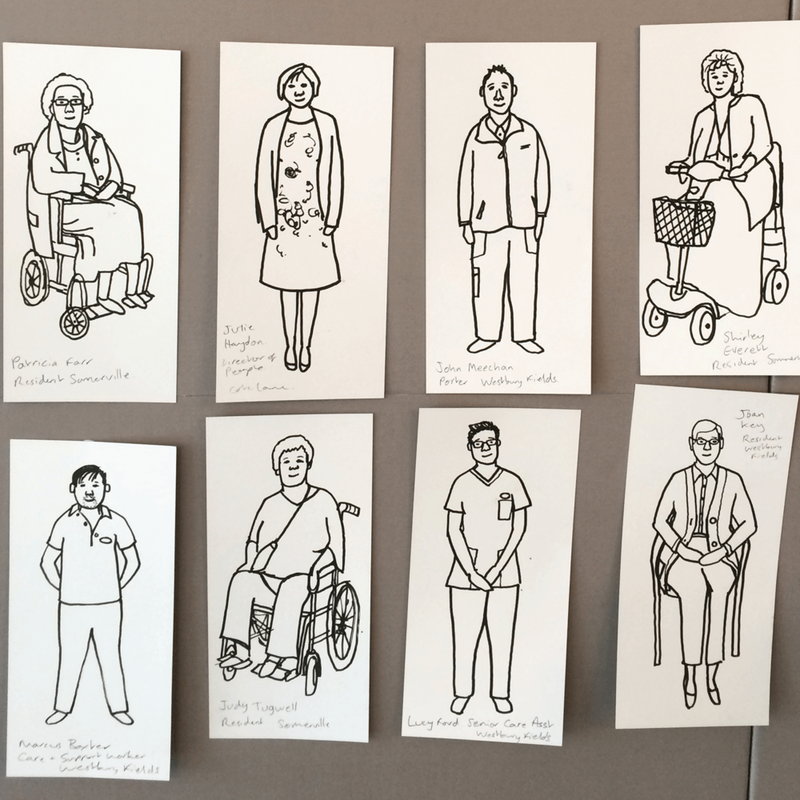 Do you feel the illustrations have resonated with the St Monica Trust residents, staff and volunteers as you had hoped? There’s been a real sense of fun around the illustrations – people liked being drawn and taking part in the drawing events. They’ve since enjoyed spotting each other on the ‘drawing wall’ at later events. The colourful artwork has linked well with our values without feeling childlike or frivolous. They have really hit what we wanted to achieve. What do you think the illustrations have added to the Vision and Values materials as a whole? The illustrations and the Values descriptions sit together perfectly. While we’ve tried to avoid corporate language, by their very nature organisational Values can be seen as ‘corporate’. The illustrations have given the Values a personality and meaning. We’ve been able to match ‘real’ people and stories to the Values, and the illustrations have pulled all of this together even better than we initially envisaged.